Bootstrap offers a few different ways of creating layouts for your page. Two of the most popular are fixed and fluid layouts. 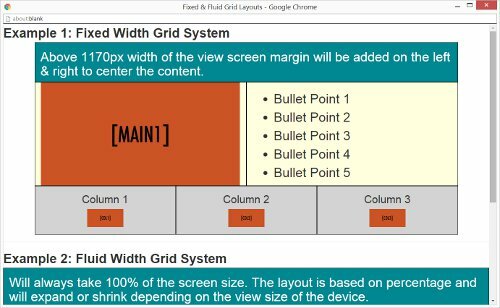 Fixed layouts will center the content with a fixed width container size of 1199px adding left and right margin to support wider screens. Fluid layouts are percentage based and will stretch or contract depending on the width of the view screen. In this project you will experiment with both layouts so you can compare them for yourself. How to create a FIXED width page layout using the Bootstrap Grid System. How to create a FLUID width page layout using the Bootstrap Grid System. The difference between FIXED & FLUID layouts. You will choose either a fixed or fluid layout then add content items to the data cells. You will then change the width of your browser to mimic the width of a phone, tablet & laptop display paying attention to how the elements on the page change position as the width increases and decreases.